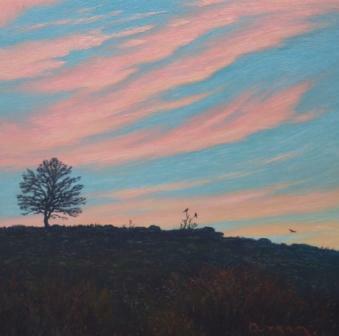 ''The Ridge'' is typical of Steven Outram''s atmospheric contemporary art. Described as a ''mood painter par excellence''� by an Art Review critic he succeeds in capturing a moment in time in a landscape. Here the moment before the sun sets and light fades. There is a wonderful sense of space and freedom in the painting. The foreground in darkness and the sky a vivid blue, streaked with rose-tinted cloud. A lone winter tree is illuminated on the horizon. This is a contemplative painting. Perfectly square with twice as much sky as land, it demands that we slow down and enjoy it.